Noah’s Ark, so long ago, and yet so relevant for today! This part of our History (HIS STORY) always seems to be portrayed as one of two extremes. Either we see the ark and the flood as a cute little children’s “story”, that is pure fantasy, a parable at most, OR we see God depicted as a mean God who desires to wipe out the entire earth. Really, it’s neither. Noah was the 10th generation from Adam, from the line of Seth (Adam and Eve’s son). Noah’s name means relief or comfort from all the hard work that man had to endure because of the curse. The ‘curse’ goes all the way back to the Garden of Eden when Adam and Eve’s sin caused man to be condemned to a life of hard labor so that he could eat. (Genesis 3:17 – 19). The days of Noah represent a time of great evil. These were the days of Genesis 6, when the Nephilim (giant hybrid beings) were on the earth. The Nephilim (giants) were the offspring of the “sons of God (fallen angels), and the daughters of men (human beings). The Bible tells us that in the days of Noah, mankind had been completely corrupted, and their minds were on evil continually. This was also the beginning of the false, pagan religions, some of which are still active today. The Nephilim were worshiped as gods. We are told that in the days of Noah, the evil was so bad that God was actually sorry He had created mankind!!! Genesis 6: 13 Then God said to Noah, “The end of all flesh has come before Me; for the earth is filled with violence because of them; and behold, I am about to destroy them with the earth. God told Noah to build the Ark, and then God gave the people of earth 120 years to repent (turn away from evil). Like so many other pillars of the Faith, Noah faithfully obeyed God. But, it wasn’t easy! Just imagine this. Here was Noah, building a giant boat in the middle of dry land, and it was taking a long, long time! Couple that with the fact that Noah’s neighbor’s weren’t exactly friendly!!! Can you imagine the mocking, the laughing, the nastiness, (and worse) that Noah and his family had to face ….for a hundred and twenty years? Do you think any of those people repented (turned away from evil)? Sadly, No. Interestingly, this post is being written on Cheshvan 10 (the days of Noah) in the year 2018. Today, October 19, 2018 IS Cheshvan 10 on the Hebrew Calendar. This was a global flood. Noah, his family, and all of the animals that God said was to accompany them, remained on the Ark for a year and ten days, until the earth was dry. After the earth was dry, Noah stepped out of the ark and built an alter to God so that he and his family could worship God with an animal sacrifice (remember the substitution principle established in the Garden of Eden). God had saved mankind, protected the “promised Seed”, and washed the entire world clean of all of the evil. God would then begin rebuilding humanity, starting with Noah and his family. God also made an EVERLASTING Covenant with Noah and all living flesh, that He would never again destroy the earth with a global flood. This was the Noahic Covenant, and a Promise by God. This is an unconditional EVERLASTING Covenant. God STILL remembers His Covenant. The RAINBOW is a SIGN of the COVENANT! 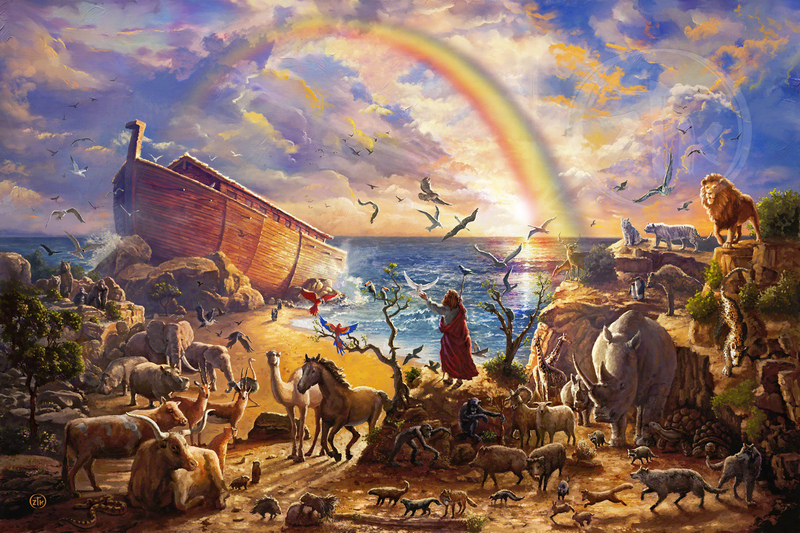 Is there Evidence of Noah’s Ark today? What about a global flood? The Bible tells us that on the 17th day of the second Month (Cheshvan 17 on the Hebrew Calendar), the Ark rested at the top of “the Mountains of Ararat” (one year and 10 days after the flood began). Ararat means “the curse reversed”. Some believe that the “Mountains of Ararat” is referring to a mountain range in Eastern Armenia. But there is an actual Mt. Ararat in Eastern Turkey, where other scholars believe that the Ark came to rest. There have been many searches for the Ark, and some claim to have found evidence of it, both archaeological evidence and satellite images. There is also geological and sociological evidence of a Global flood about this time-period in history (HIS STORY). • The flood was sent to judge wickedness. • God sent the flood to drown all the people. • It began to rain. • All the land was covered. • A man and his wife in a boat with an animal. • A bird with a leaf in its mouth was the sign of dry land. • They landed on a mountain. All other people drowned. • There was a sacrifice of blood at the end of the flood.